It contains reference books relevant to natural and cultural history of the Island, scientific papers and reports, original manuscripts and notebooks. The cafe is open daily to provide coffee, drinks, cakes and lunches and on Sunday and Thursday evenings for dinner. 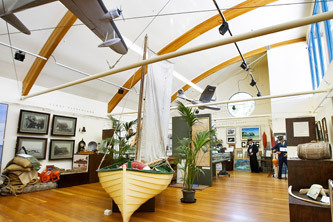 The retail shop sells a range of quality books and maps about Lord Howe Island's history, flora and fauna as well as selling photographs, postcards, local crafts and clothing items.